The Canadian Rockies are one of North America's real treats. 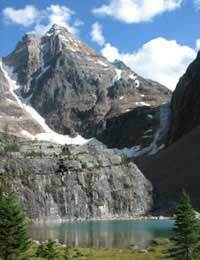 The mountain range makes up the Eastern part of the Canadian Cordillera, the name for the mountains of Western Canada. The Canadian Rockies extend from the Interior Plains of Alberta all the way along to the Rocky Mountain Trench in British Columbia. Alberta is home to some of the most beautiful scenery in Canada. The majestic Rocky Mountains stretch all the way through the province, and provide visitors with the perfect winter backdrop to some of the most famous resort towns in Canada. To illustrate the fact - Banff National Park is so popular that nobody is actually permitted to buy property there unless they are working in the area, studying there or own a business. There are no exceptions, and quite rightly you have to demonstrate a certain level of commitment to the area to be allowed to buy your home there. You’d also need a pretty hefty level of income as Banff and the surrounding areas are highly desirable and extremely expensive. If skiing, snowboarding and other winter sports are your idea of fun, Canadian resorts of Banff, Jasper and Lake Louise are the places to visit. All three are famous for their world class ski runs and other winter sports, and if the sporty stuff isn't your cup of tea you can still take in the views on the various Gondola rides (Sulphur Mountains views are incredible.) Ice Skating at Lake Louise has to be done - or at the very least, watched! For jaw dropping beauty, if the weather permits you could drive the Icefields Parkway, a highway which stretches from Jasper to Lake Louise along Highway 93, taking in the Jasper and Banff National Parks in 230km of scenic road. You can see the Columbia Icefield from the Parkway, and if it's open (sometimes it can be closed over the winter months as it's too dangerous) some tour companies run specific Icefield tours that give you a chance to actually get out onto the Athabasca Glacier. British Columbia features everything from a Pacific ocean coastline to the start of the Rockies - and is playing host to the 2010 Winter Olympics, in Vancouver and Whistler. Vancouver is the biggest city in British Columbia and it’s popular too. Vancouver was voted the Most Liveable City in the World by the Economist Intelligence Unit, so the place is well worth seeing even if it’s just to find out what you’re missing. If you’re feeling brave, the views from the Capilano Suspension Bridge are spectacular. Vancouver itself doesn't get a massive amount of snow, but the mountains boast ample amounts which make it a great place to go for Skiing, snowboarding, cross-country and snowshoeing. Just an hour from downtown Vancouver you can find three spectacular snowy mountain sport havens - Mount Seymour, Grouse Mountain and Cypress Mountain. Whistler is another world famous winter sports resort – it's one of the top four in North America. As well as the usual snow related sporting pursuits and general cold weather fun and sledding, you can choose watch other people falling off of their snowboards while taking a leisurely gondola trip up across the Whistler Valley. The Rockies aren't just for sporty types - the towns of Calgary and Vancouver also offer some great shopping and leisure activities that don't involve potential limb damage, and the resorts of Banff, Lake Louise and Jasper cater for sports fiends, nature lovers and take-it-easy types alike.